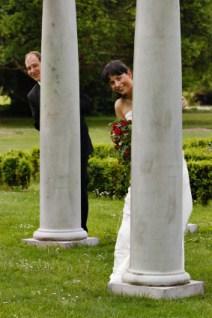 Use columns in wedding photos. Columns for a wedding decoration are a romantic yet versatile choice. From the wedding ceremony to the reception, columns can be manipulated to fit in with practically any theme or style. Using columns in weddings is a good way to create a picturesque background for the ceremony and reception. Columns of varying height add depth and visual interest to simple location, and provide a base for additional decorations that fit into the wedding scheme. Typically, columns are round white pillars. They may also be square or sometimes even a hexagon. Some have embellishments at the top or bottom near a flat base that provide a place to put wedding flower arrangements or other decorations. They range anywhere from a couple feet high to ones that reach the ceiling. Columns are usually viewed as a foundation for other decorations. However, if you are planning a Greek or Roman themed wedding, they are beautiful by themselves with just a simple ivy garland wrapped around them. Wedding locations, such as churches or banquet halls, might even have small columns available for use when you book the location. Otherwise, a wedding florist or rental supply company often has a variety of columns for rent. Locations themselves might even have columns within the architecture of the building(s). Due to their flexibility, columns are often used in both ceremonies and receptions as a decoration piece. Most are hollow, allowing them to be moved from one location to the other, or in and out of photographs, with ease. Columns are great wedding backdrop decorations. Columns are a beautiful choice for decorating a wedding ceremony location. Enhance the front entrance with columns next to the doors, topped with flower arrangements. In a location with lots of steps, place slender columns on every other or every third step. Place columns at the end of each row of seating as a wedding aisle decoration. Add a floral arrangement or other decorative accent to the top. Cover up an unsightly background by placing tall columns at the front of the altar area and then weave tulle decorations between them as a wedding backdrop. Use columns to create boundaries and decorations at an open-air outdoor wedding ceremony location. Flower arrangements are probably the most typical way to top a wedding column, but they are not the only way. Consider topping the column with a basket of fresh fruit, candles and flower petals or even plastic wedding bells as alternatives to flowers. At the reception, columns are frequently used to create a beautiful lighting scheme. Wedding reception lights are important for setting the mood, and columns provide the perfect accessory. Wrap strands of lights around columns placed around the edge of the room. String wedding lights from the tops of tall columns at the reception location, swagging them or making a pattern to create a lovely overhead lighting arrangement. Similar to the columns used at a wedding ceremony, columns at a reception are often used to designate important areas. Use them to create a backdrop or flank a wedding party table, cake table or band/DJ staging area. Tall, heavy columns can even designate the dance floor area of the reception. Create an entire decorating scheme around columns. At a wedding where the ceremony and reception feature columns throughout the decorations, consider making centerpieces that feature miniature columns. Buy or rent small columns that are between six and ten inches high. Add some small floral accents and top them with a tea light to make creative table décor for the reception. Repurpose the columns beyond the traditional decorative purpose. Large, sturdy columns that reach approximately chest height can double as cocktail tables. Place them strategically throughout the area, with a small table cover. Add a small fan of cocktail napkins in the center of the table. 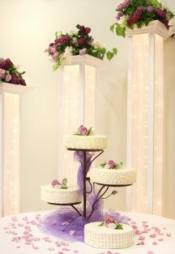 Wedding columns are a simple way to create dramatic décor at a wedding ceremony or reception. Small ones are easily moved in and out of pictures. If you happen to get a location with architectural columns, enhance that by adding some decorative ones. Think beyond typical uses for columns and you are sure to have a wedding decorating scheme that suits your personal style.